Finally, a cookbook on sauces that is fresh, vibrant, and alive. Mastering Sauces veers away from traditional lesson plans and presents sauce-making in a whole new way. It focuses on how great cooks all over the world make sauces with impromptu élan—they splash and drizzle, slather and douse. Great sauces are made by following three fundamental principles: Maximize Flavor, Manipulate Texture, and Season Confidently. Armed with these principles, you can make any sauce your way. 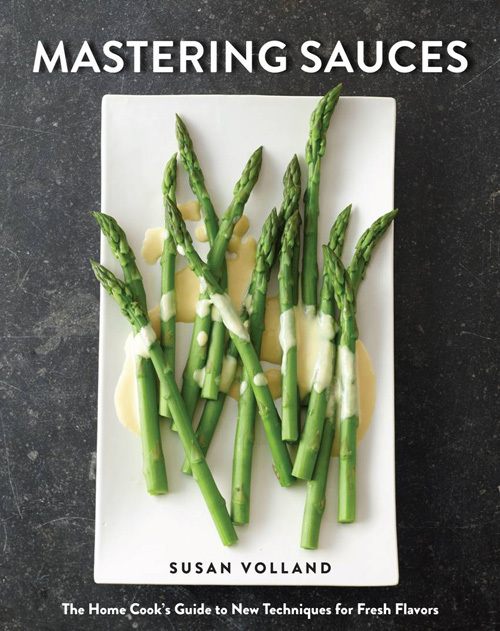 In a conversational and very readable style, Mastering Sauces teaches the “whys” and “hows” of sauce-making so cooks can better understand their ingredients to create the dish they want. Support your local independent bookstore. Order copies at Book Larder, Omnivore Books, Powell’s, or search for a store near you at IndieBound.com. What Makes a Perfect Sauce? Searing Inspiration is now available at your favorite retailer. My newest book, Searing Inspiration; Fast, Adaptable Entrees and Fresh Pan Sauces is now available! Ever worry about getting sauce splotches on your hard copy? (I consider it a badge of honor.) Order a paperback today! Do you know about FareStart? The students and team are truly an inspiration and I’ve been honored to work with them. Check out their website to learn more. © 2019 Susan Volland. All rights reserved.